Christmas will soon be upon us and we don’t know about you, but to us our Christmas outfits are a big deal. 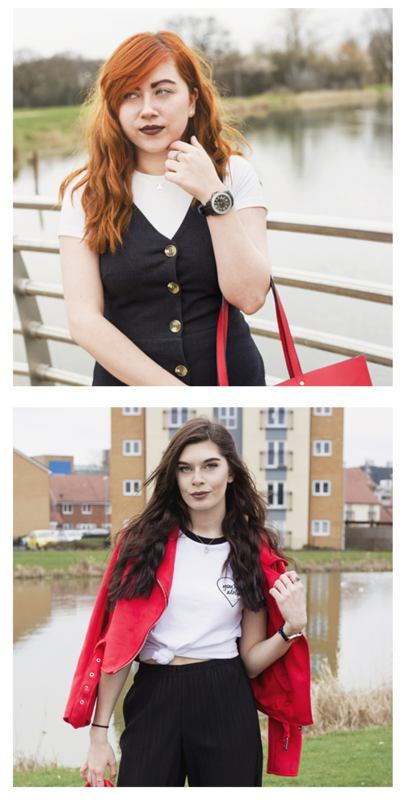 We’ve teamed up with the lovely Sophie from Shy Life Living and put together 3 different styles of outfit to give you a bit of inspiration. Whether you’re heading to a Christmas or New Years party or looking for something to wear on Christmas day, we hope this will help you find the perfect festive outfit! One thing I love about this time of year is that you can wear glittery clothes! This top reminds me of the clothes I used to wear on Christmas day as a kid, or the outfits our mum used to buy me specially for my Christmas parties at school! It takes me back to my childhood, all while keeping my outfit mature. It was only £3.99 and the colour is absolutely beautiful. It’s so different to everything else I usually wear but hey, it’s nice to have a change and wear some colour for Christmas! I paired it with my high waisted black denim skirt which is such a simple but smart look. 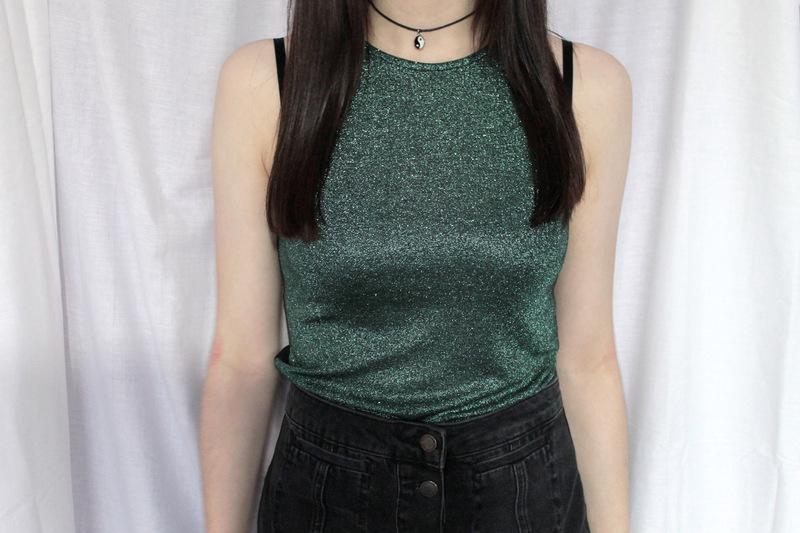 This outfit could be worn on Christmas day or any Christmas or New Year parties with some tights and a leather jacket thrown on for a more casual look! I chose this outfit because I thought it was simple so you can easily swap pieces in and out for what ever you feel comfortable in. 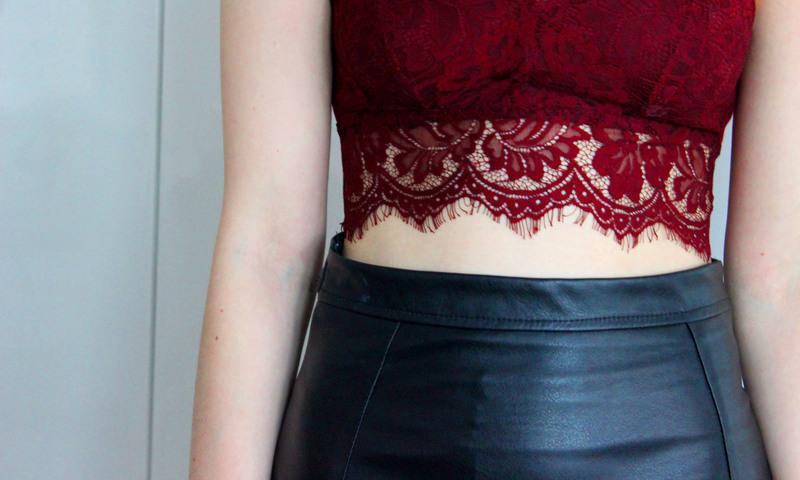 Red is a classic colour for Christmas and lace is great for any type of party. I love how the lace has the details at the bottom, which shows a bit of skin but in a subtle and nice way, it also shows off my winter paleness!! 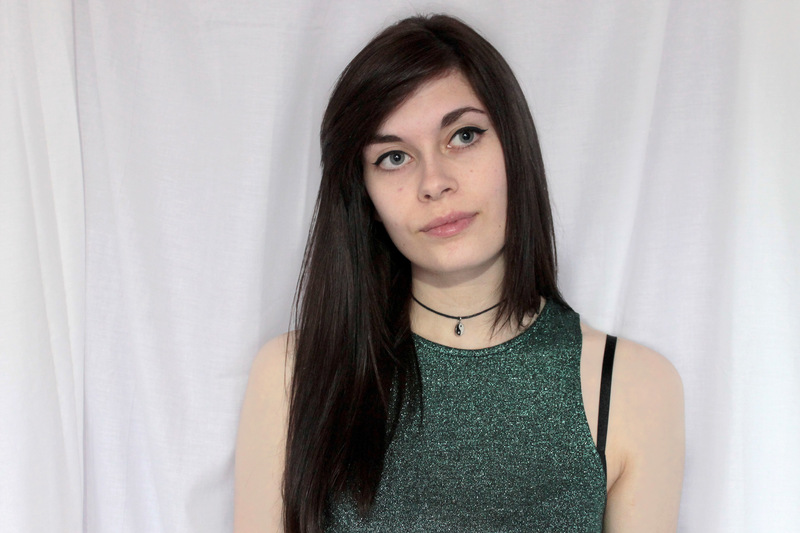 Why am I so pale?? The red lace is formal and great for parties and can match with a cute Santa hat. I thought of matching it with the fake leather skirt because it’s on trend and easy to wear. You can throw it on with tights and you’re ready to go but you still look put together and ready for a party. I’ll be wearing this throughout the party season and I’m thinking of wearing it for a fancy dress party. Something I love about this time of year is that you can wear practically any dress and not feel ‘too dressy’! I bought this dress from Topshop last year in the sale and I won’t lie I haven’t worn it yet. That being said I’m thinking of wearing it on Christmas day! It fits so well whilst still being comfy and it’s velvet too what could be better?! I did think that to change it up a little bit I could pop a hair accessory on. I found this cute red tie that gives it a different sort of vibe whilst adding a little pop of colour! 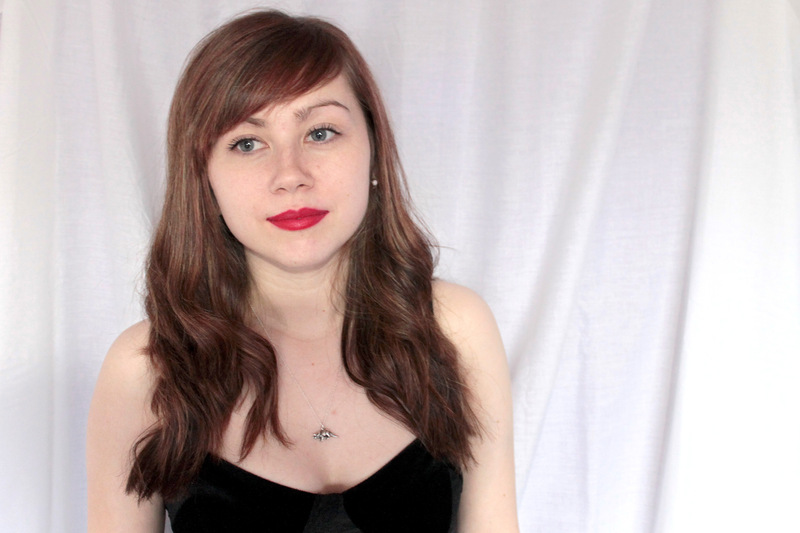 Seen as red is a colour associated with Christmas, I decided to wear a red matte lipstick too! So there are three festive looks we’re loving at the moment. 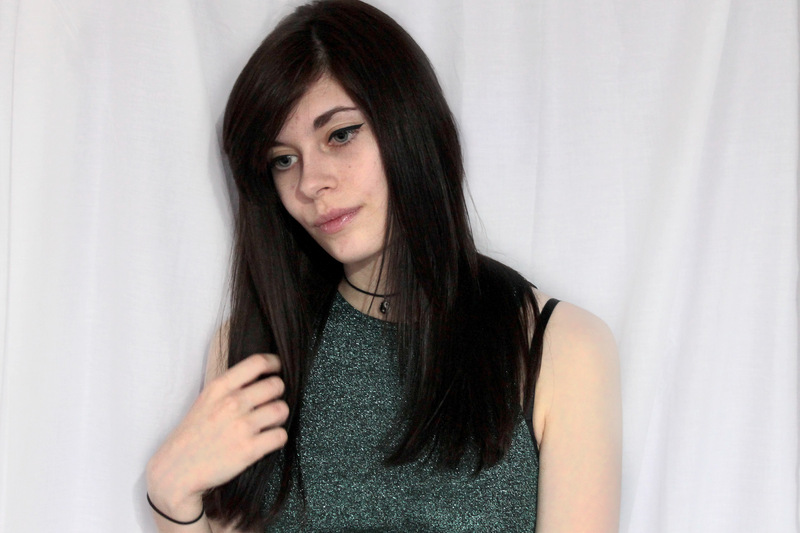 Thanks again to Sophie for teaming up with us for our first ever blogger collaboration, make sure you keep checking her blog for a winter collab with us! On behalf of all 3 of us, we hope you enjoy the Christmas season and any parties you’ll be going to! Very pretty! 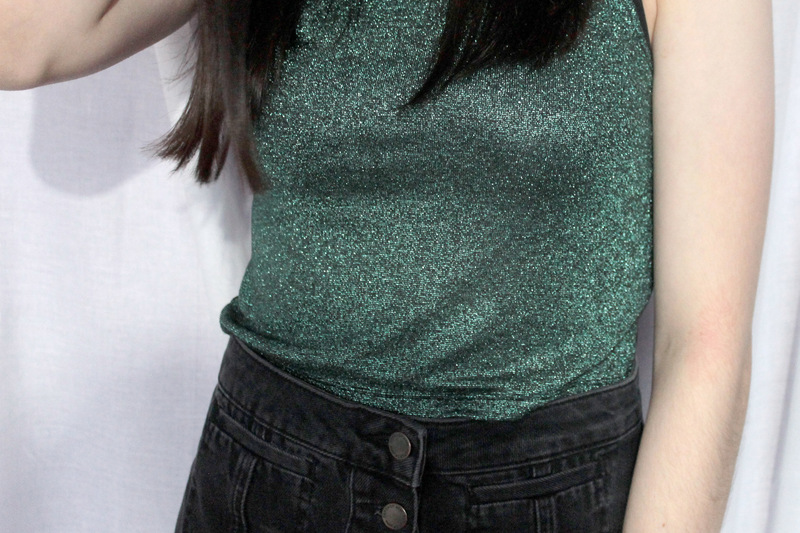 I love the green shimmery top!